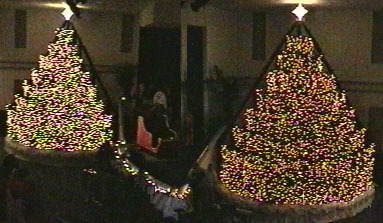 "The Twin Living Christmas Trees"
Mid-way also uses a LanBox for control of stage lighting (NSI dimmers) and intelligent moving lights. For their first two years, each tree had a single MidiLite frame providing row-only effects with 6 colors. They pre-wired their trees for a full-matrix which allows them easy expansion options. For 1999, they have added a 3rd frame and have decided to "mirror" the two trees. This will allow for better effects on the tree, but both trees will be doing the same thing. Because of the size of the auditorium and the stage layout, it is difficult to actually watch both trees simultaneously anyway. Future plans are to expand to a full-matrix system. Join the thousands of people this Christmas season who will experience the first of a new Triangle family tradition. *Exciting pageantry featuring an exquisitely costumed dramatic cast, with over 200 adults and children involved! *A heart warming family experience that brings together the tradition, music and drama that light the heart of Christmas. Tickets may be purchased at Mid-Way Baptist Church during regular office hours, Monday through Friday, 9 a.m. to 5 p.m., or by calling (919) 772-5864. Cash, check VISA or MasterCard accepted. For more information, call (919) 772-5864.